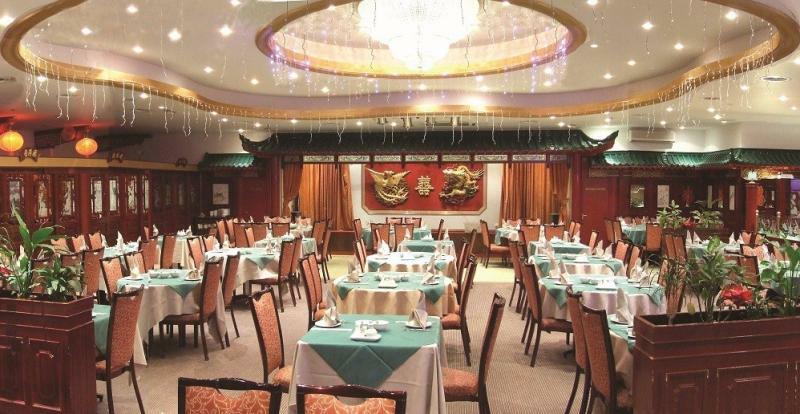 Head out of Manchester towards Oldham to find this Chinese restaurant, Ocean Treasure, above an oriental supermarket: you can't miss its colourful pagoda-like exterior. Inside, it puts on a plush face with dark woodwork, pale sea-blue colour schemes and mirrors; there are also fish tanks where crabs and lobsters while away the time until they are despatched in the kitchen. Daytime dim sum are well up-to-the-mark: on the list you might find har gau (steamed prawn dumplings), beef balls with greens, shark's fin dumplings in 'high stock', and pungent chiu chow fan gar filled with minced meat, dried shrimps and preserved vegetables. In addition to crustacea from the tanks, the kitchen also delivers a range of seafood dishes like deep-fried crab claws 'wrapped with king prawns', sweet-and-sour yellow croaker, steamed razor clams with soy and ginger, and mega-expensive braised sun-dried abalone. Alternatively, opt for something more conventional like aromatic crispy duck, Szechuan king prawns with chilli or stir-fried pork in black bean sauce. Whilst the starter of salt and pepper ribs gave a promising hope of equally good dishes to follow, I am afraid it stopped there. My choice of Chicken with crispy noodles was presented well but proved bland and tasteless. Another dish, described as lamb, could have been beef or pork!, no particular taste of anything. My local Chinese takeaway could show them a thing or two on taste and on staff friendliness. What a miserable lot at Ocean Treasure. The only smile came when we pointed out he had not listened to a request and he tried to smooth it over. After picking up a hefty bill, decided it was a one off visit. Best Chinese meal in years! Come here regularly usually for the business mans lunch but have also had banquets and Christmas meals and food is always to a good standard and service good sometimes is really busy and so obviously takes a little longer to be served but this is only to be expected. The lunchtime menu is particularly good value costing only slightly more than the local Chinese Chippy. Visited on 10th Jan 14, having been many times previous, be it at least 7 years ago, quiet a few times. I and my partner. We're looking forward to it immensely, how very wrong and disappointed we both are, my partner received her starter at least 20 mins before mine, the quality of the starters poor, greasy batter on the salt n pepper dishes, The main meal took 40 mins to arrive after the late starter was finished, and the quality poor! The black bean fillet steak tough! (fillet steak???????) My partners scallops extremely small pieces, and I mean pieces! £100 wasted , never again. Disappointed ! !